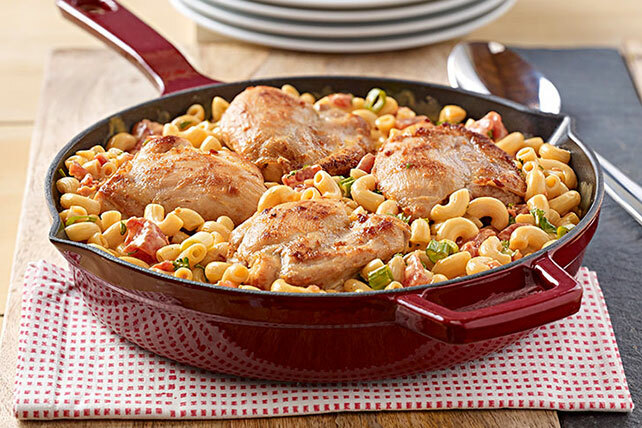 Chicken thighs cook up tender, juicy and delicious in this super-easy skillet dish made with mac and cheese, tomatoes and green onions. Heat oil in medium skillet on medium-high heat. Add chicken. Cook 7 minutes on each side or until cooked through. Meanwhile, prepare Dinner as directed on package, substituting large skillet for the saucepan. Add tomatoes, onions and parsley to prepared dinner; mix lightly. Top with chicken. Always thaw frozen chicken in the refrigerator, not on the countertop.